Last time I threw myself against volcanoes and hills that tore me to pieces. Now it’s time for some rest, some holiday festivities, and a chance to explore Mexico’s most infamous magical city. Shop in Catemaco. Photo by Andre. There’s no doubt that Catemaco has its secrets. The streets hold the same promise as certain out-of-the-way parts of New Orleans: the sense that you could disappear into another world, that the ramshackle houses hold more than they let on, that unseen eyes are aware of your approach, and that you, dear visitor, will never know a hundredth of what goes on there. Not every neighborhood is like this. 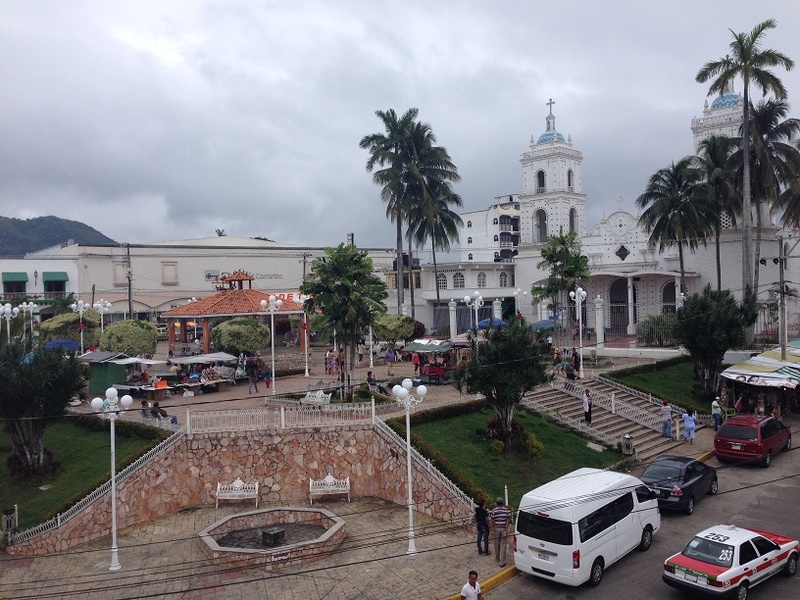 Much of Catemaco is a typical mid-size Mexican town. It has convenience stores, gas stations, cyber cafes, and all the usual shops. It’s not a rich city, but most of the area’s commerce is concentrated there—and it gladly leverages its sorcerous traditions to fuel a growing tourist economy. But just a few blocks from the centro, with its one colonial church and its tile-roofed restaurants, you can find lonely, quiet lanes that head toward the magic lake. Theirs is not the malecón with its sand beach, seafood stands and boats for hire. No, these streets cross without warning from residential lane to forested lakeshore. Under the gloomy trees are unmarked cottages made of sticks and thatch, piles of coconuts that were cut and then forgotten, scraggly, thorny brush crowding in on narrow foot paths. 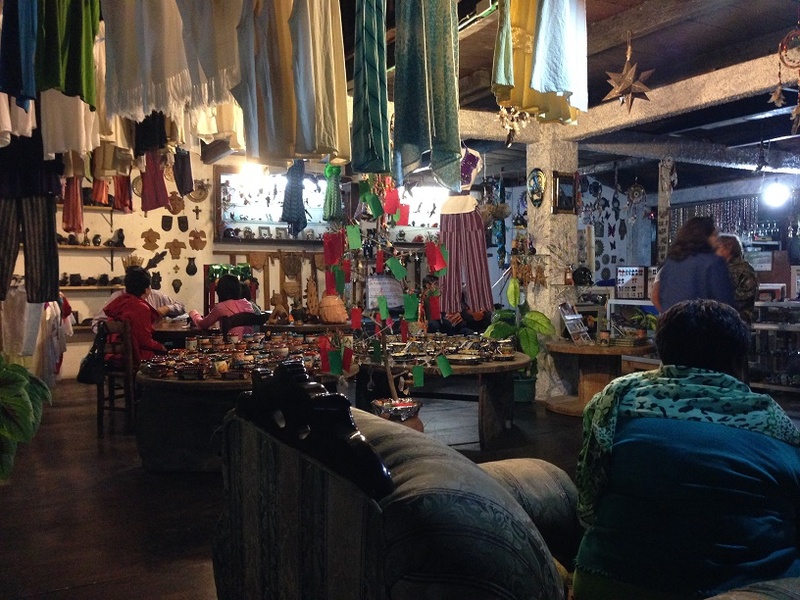 It’s all deliciously similar to the dirt alley that leads to our Vodou temple in New Orleans, and I have no doubt the local practitioners gather there. Just beyond you can just see the silver water of the lake, and at its edge a few thatch-roofed seafood/beer restaurants. These are the haunts of locals, not tourists. I poked around, but in the light of day the only person present was an old man gathering sticks. This is a microcosm of my experience with Catemaco. I would find hints and promises of mysteries to be explored, but could never quite get my nose in them. Not that I pushed too hard: I wanted to meet one (or more) of the sorcerers, definitely, but only if it came naturally. And above all, only if I felt in my heart that I had found someone sincere in their beliefs. I have no interest in tourist charm-stores. There was one very overt magic shop just a block from my hotel. On its wall was a hand-lettered list of all the services performed: amulets, magic baths, spells for money and love, curse breakings, and about 30 others. They barely had room on the building for a doorway. I would glance in as I went past, often several times a day, but I never once went inside. I just got a strong, strong vibe that this was for show, that this wasn’t where I wanted to be. In my world, it would be better to meet someone at a restaurant or in the market, by chance. Or perhaps stumble on an out of the way shrine and be noticed making an offering. Or even lock eyes with one of the old ladies at the mystical artifact booths by the square, and realize abruptly that she seemed trustworthy to me. These sorts of organic connections are, I find, much less likely to lead to a charlatan. They’re also more rare, and if you insist on waiting for them you can sometimes wait a very long time. Thus, several days into my time in Catemaco I realized two things: (1) I wouldn’t learn anything about the magic traditions if I didn’t go into the tourist shops, and (2) I was okay that. I found a curious peace at the thought of not diving into yet another mystical tradition, if it also meant not having to deal with a bunch of sales pitches along the way. Instead I tried to take Catemaco as it is. And it certainly is a spiritual place. The lake is not just the reason the city exists, it’s also the reason its magical arts exist. Lake Catemaco and the mountain above it are reputed to be sources of mystical power. They certainly are breathtaking. The green mountain rises out of the mist and the jungle-covered hills like a grandfather swarmed by his grandkids. Whether the sky was cloudy or pure blue, the lake itself always seemed to be the same silver-mirror color. The surface would ripple in what little wind reached it, and never formed waves bigger than a canoe. There are islands in the lake. One of these has a chapel and some old ruins on it; my priest radar pinged and I’m 100% sure sorcerers conduct their rites there. Others have nothing but forest. Three of these are home to three different species of monkeys (one species per island). One was seeded intentionally with a few members of an endangered species, and has become a preserve to replenish their numbers. I strolled the lakefront one day hoping I could rent a kayak, but the only options are tour boats. Each boat seats about sixteen people, and they don’t wait to fill them up; as soon as you pay the man he casts off. I found the idea too depressing. All those empty seats, and nothing but the awkward bad-Spanish chit chat about where I’m from and what I do. I went to the shore of the lake and made offerings, but stayed firmly on land. Cool building near the square. Photo by Andre. The lake is also a major source of food. While much of the seafood sold in restaurants—grilled fillet of fish, octopus with garlic, shrimp cocktails—comes from the coast 30 miles away, I kept seeing signs for tegogolos. It took me a while to find out what this is. It’s a word for the local species of freshwater snails that are pulled out of the lake everyday. Every street has one or more homes that sell them by the kilo; all the restaurants serve them as well. I decided to try them, of course, but first I wanted to find a good restaurant. The only way to do so was to try a few out. The first contender was just steps from the beach where the tourist boats go out. Covered by a thatch roof, it was called Restaurante Buena Vista (“Good View Restaurant”) and indeed has a great view of the lake. Sadly, I wasn’t impressed. I spent one of my first afternoons there, eating some poorly prepared shrimp cocktail, some lukewarm tacos and, thankfully, a few beers. I’m really glad I didn’t trust these people to take my tegogolo V-card. Wondering if there is such a thing as truth in advertising, I went there the next day. The meal they brought me was ridiculously good. Their shrimp cocktail was much fresher, and the octopus I ordered had that crisp just-done-enough-but-not-chewy quality that so few places master. I also noticed that in the evening, when the Buena Vista ran out of tourists and closed for the day, the Buen Sabor filled to capacity with Mexicanos. I went there several times and every single meal was exceptional. So I’m sure I couldn’t find better tegogolos than at the the Buen Sabor, and that was where I tried them. They were… meh. Not gross at all, as you might worry snails would be. If you like oysters, imagine a tougher, chewier, slightly bitter version of those. (That description may leave you saying, “That doesn’t sound as good as oysters,” to which my answer is, “Right.”) They were cooked, I think, but the Buen Sabor serves them cold, covered in lime juice and chopped tomatoes with a hint of onion. They also give you muchos more limes so you can squeeze them over the snails to taste. With or without extra sour, I was not wowed. If they were, say, sauteed in garlic and butter and served hot they might be tasty. But that’s basically just covering up their natural flavor with other ingredients. Bottom line: not my thing. The view from the Buena Vista really was good, though. Photo by Andre. I was disappointed that I didn’t arrive in time for Christmas in Catemaco. In Vodou, Christmas eve is dedicated to the Petwo spirits (a nation of spirits all loosely associated with fire) and is celebrated with large bonfires and some sacred fire rites. I wanted to see if the local magic/spiritual traditions do anything similar. But I had fallen pray to sidequests: first the ghost towns of Real de Catorce, then a homestay with a family in San Miguel, and extended stays in Tula and Huamantla. 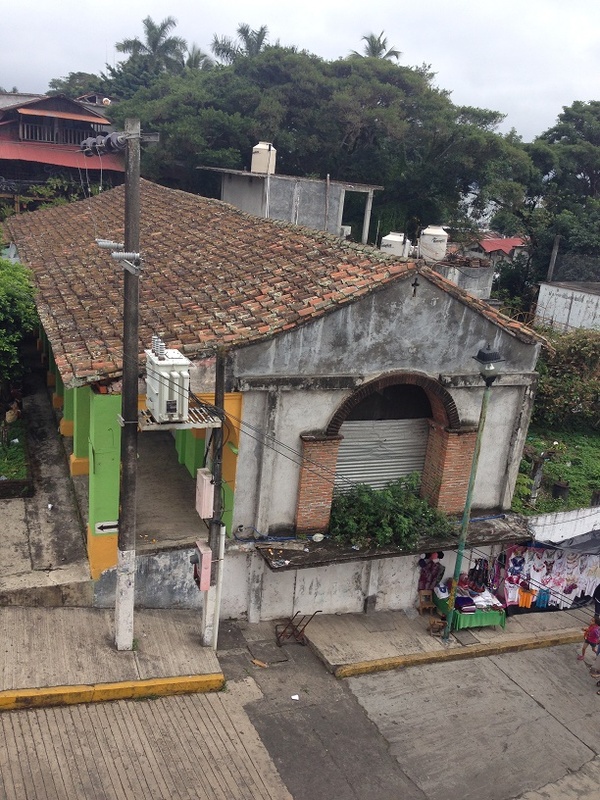 I’d ended up spending Christmas in Xalapa, just three days’ ride away. 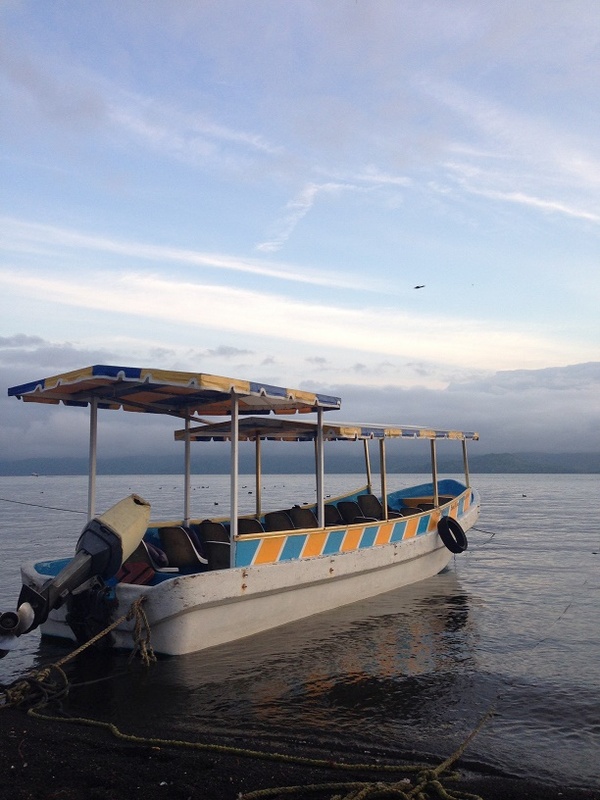 I still had a chance to stay for New Year’s, however, and I was curious what it would be like in Catemaco. Until then, I had plenty of client work to catch up on, and a little exploring to do. Places to work were limited. My hotel room had a balcony, which seemed like the ideal writer’s nook once I pulled a chair and table out there. The hotel wi-fi was iffy at best, however, and the signal was virtually nonexistent outside. The centro had two potential work hangouts. Both were second-floor coffee shops with a view of the square and a robust menu of food, coffee and drinks. One of these had a thatch roof and hammocks to lay in, as well as its own book and handcraft store (la Casa de los Tesoros). The overall vibe was that of a giant treehouse. It also advertised organic wines and locally made chocolate. It’s exactly as heavenly as it sounds. The downside was it could get quite crowded and, of course, no one wants to spend every afternoon and evening sitting in the same cafe. The other option was perhaps even better. It had a more reasonably priced menu and very strong wifi, and it was cozy though nothing like the treehouse. This would have been my #1 pick for serious work spot, with the other one as my hangout for evening reading, except for one snag: this place was only open at night. Between these two places and using my phone as a hotspot at the hotel, I caught up on all my client work while in Catemaco. I also found an excellent Italian restaurant tucked away on the lake shore road, which made a nice change of culinary pace. For a small town, Catemaco is a good place to eat. Inside Casa de Los Tesoros (the treehouse). Photo by Andre. My knee was sore for days after my ill-fated arrival, but about three days in (and after plenty of ice) it seemed to be doing well. I decided to take a day trip along the shore, with no cargo on the bike, and see how I held up. This area is one of the most beautiful spots I’ve found in our world. The surreal hills, like folds of a crumpled green blanket, positively glow with dew, mist and the flutter of creatures beneath the canopy. Traditional houses, with brightly painted walls and thatch roofs, peek out from clearings beside the road, with carefully fences to keep the chickens in. These are people who have smartphones, use the internet, and drive to work in trucks or on motorbikes, but continue to use traditional thatch roofs because they let the breeze filter into the home while keeping the sun and rain out. I went some miles up the road and around a curve of the lake. People were surprised to see me but friendly, waving as I went past. A few wild dogs kept after me for a bit but dogs have long since ceased to worry me as a cyclist. I ignored their gnashing jaws and they lost interest soon enough. Most of the road was hemmed in by jungle and hills on both sides. Once in a while I’d catch sight of the lake, glittering platinum as always, in a drop between horn-shaped peaks. The ride was uphill, but with no weight on the bike it was pleasant. Finally, about two villages on, I got the best view of all. A small gate guarded a road that ran straight to the lakefront. The land there had been cleared—someone’s ranch, I suppose—and I could see homes, palapas and a dock on the shore below. That was as far as I needed to go. I committed that beautiful vista to memory, grabbed a video of it for supporters, and turned around. Catemaco’s centro as seen from the hotel. Photo by Andre. The big night finally came. In the preceding nights there had been giant gatherings in the centro, with people wearing costumes and dancing in a big circle. These events emanated the unmistakable music of African drums, confirming my suspicion that the local traditions might be influenced by the African diaspora. On New Year’s Eve, however, the square was oddly quiet. In fact, it seemed deserted, even an hour before midnight. A party was happening at the treehouse, however. I’m lucky I arrived when I did, because not long afterward they locked the downstairs gate. I get the impression that most of the people upstairs were there by invitation. The staff knew me as a regular, however, and they seemed happy to let me stay (one even told me he would secretly leave the door unlocked for me when I had to step out to run to the hotel). I took a seat off to the side, ordered some wine, and—of all things—caught up on some reading on my laptop. The life of a solo traveler is not always a gregarious one. Groups of people did filter into the square, but never very many. Beside the plaza was the pyrotechnic crew surrounded by an impromptu cordon. At midnight they began their volley: an explosion of fireworks that would give any Fourth of July a run for its money. The difference, of course, is that there are few regulations in back country Mexico. The rockets were launched just meters from where spectators stood, aimed loosely into the air over the plaza and a city that still uses thatch roofs. I spent at least as much time watching with fascination as burning shrapnel fell among the streets, the roofs, and even the groups of revelers below. To them, the incoming flames seemed to be a great game: children dodged and danced among them, laughing, while parents looked on with grins. With each new flaming shower a chorus of shrapnel went tink off the treehouse’s tin roof. When the fireworks stopped most of the celebrations did too. One family stayed in the street below me, the parents chatting while the kids threw firecrackers, but the treehouse emptied out and so did the streets. That was New Year’s Even in the City of Sorcerers. Pretty fun, but pretty normal, too. The next morning I would get up, strap everything back on the Giant, and bike down the malecón one last time, stopping to admire the silver lake before taking to the road. Next time we’ll see if my knees are recovered enough for the mountains ahead. Until then, get yourself a postcard and check out my other road logs. 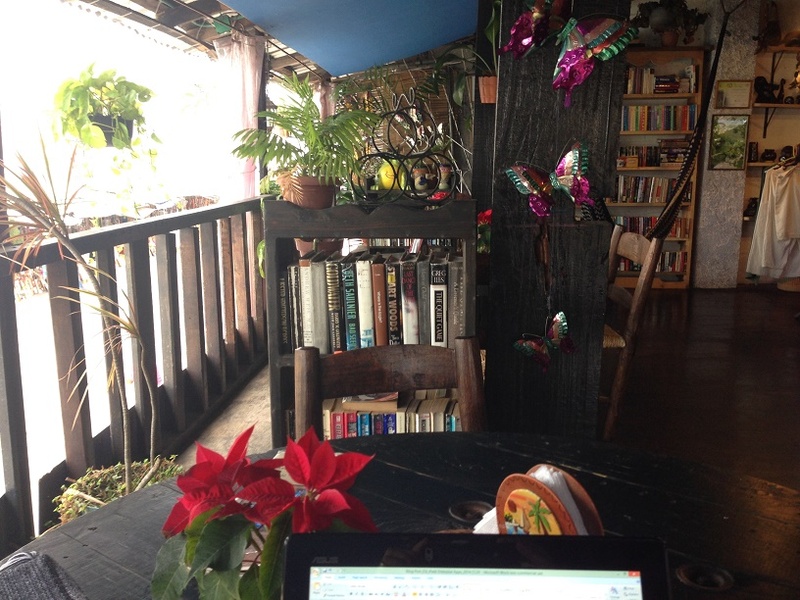 I am Jess, owner of La Casa de Los Tesoros (The Tree House) in Catemaco, Veracruz, Mexico. A friend recently referred your blog “Mexico’s City of Sorcerers” to me. I remember you from your visits to our café at years end and I thank you for your kind comments on La Casa de Los Tesoros. We strive to make our café a unique and comfortable experience for our guests; and we welcome comments both favorable and not so favorable, along with suggestions as to how we may improve our services. 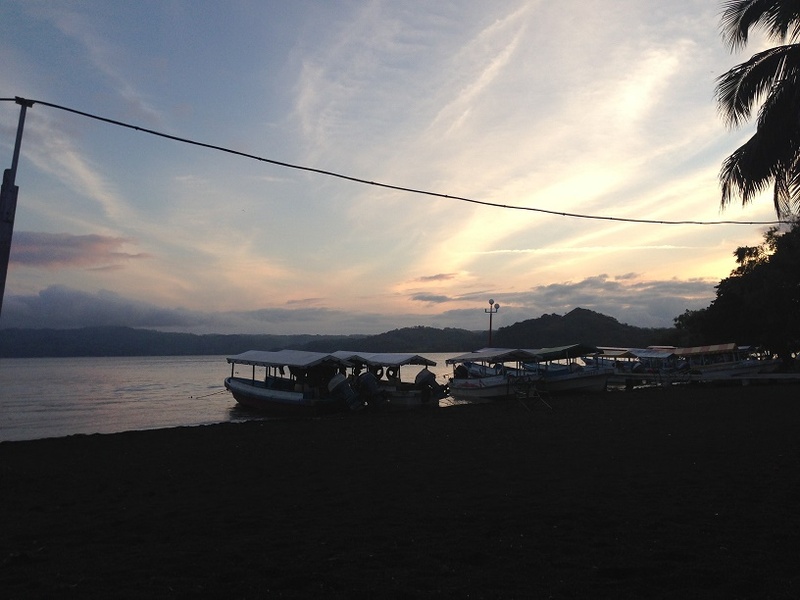 I am pleased you enjoyed your visit to Catemaco and hope that, should you return, you spend some time again with us. Jessica, I’m surprised you remember me but thank you for commenting! I’ve added the name of la Casa de los Tesoros to the post along with a link to your Facebook page. I may pass through Catemaco in June if I take a trip back to Xalapa. If that’s the case I will stop in and say hi!